Sports-Fitness-Solutions Newsletter, Issue #041WHY DO MY FITNESS RESOLUTIONS FAIL? WHY DO MY FITNESS RESOLUTIONS FAIL? It’s now after January 1st and I bet a lot of you’ve made fitness resolutions that you’re sure this time you will keep. I know your intentions are good; but let me ask you this simple question, "why do you think that this year is any different from prior years when you failed to keep your New Year’s Fitness Resolutions?" Please don’t get me wrong, I believe in setting goals and then working a set plan to attain those goals. In fact I’ll help you in any way I can, to achieve your fitness goals. However I realize how hard it can be to keep those resolutions; and here are a few reasons why I feel the odds of success are stacked against you. For most people, there is no accountability built into their Fitness Resolutions. Think about it. When’s the last time you were accountable for any of the New Year’s resolutions you’ve made? Who were you accountable to? What happened if you didn’t keep your resolutions? See what I mean? Most of the time resolutions are made without any thought to how they will be reached. No plan is in place to follow. Without a step by step plan to follow, it’s easy to go in the wrong directions and ultimately back to your old habits. Remember "a goal without a plan is just a wish." Don’t wish that you’ll reach your goals, make them happen. Follow a detailed plan to your success. Many times New Year’s resolutions are simply a vague, open ended wish list, and not a goal oriented target to accomplish. Most resolutions have no definite timeline and they most often don’t have any corresponding behaviors attached them. Basically, they are just a list of words. Put together a schedule for accomplishing each of your resolutions. If you do they become a little more real. Simply ask yourself, what does each goal mean to you? Why do you want to achieve it? What happens if you don’t achieve it? What’s your reward if you do achieve it? How will your results change your life? Again make your resolutions real, and then go get them. Once a goal is made, it’s often pushed to the back of your mind by your busy daily schedule. Think back to your previous attempts at Fitness Resolutions, how often did you think of your resolutions outside of the few days around Jan 1st? How often did you remind yourself of what you wanted to achieve? Post your resolutions where you can see them each day. Don’t let them fall from your focus. We are really good at lying to ourselves. Think about it. How many times will you tell yourself you’ll do something, but then put it off until tomorrow; and then that tomorrow never comes? How many times will you tell yourself that you’re going to get up early and work out, only to set your alarm clock and when it goes off in the morning, your first response is to press snooze? Sometimes you press it more than once. Or how about when you fall off your nutrition plan by sneaking a dessert (or two) and then quit the plan completely because of that weak moment? Don’t fool yourself. Don’t let anything stand between you and attaining your fitness resolutions. The main reason that most resolutions fail is because no action is ever taken to reach them. Without action resolutions are simply words without meaning, wishes. These actions don’t need to be huge, life altering changes. They just need to be consistent. Ask yourself the following simple question, does this take me closer or farther away from my ultimate fitness goal? There you have it, my thoughts on why Fitness Resolutions are almost never attained. However you can make 2011 different. So how do I reach my goals it’s not that hard. Set attainable fitness goals. Partner with someone when you workout. Make yourself accountable to someone you trust. Write down, step by step, how you’re going to reach your goal. Start now to execute your plan. Don’t give up; you’re going to hit obstacles along the way. Embrace them when they come, and work to overcome them. Finally set up a Reward for yourself when you achieve your goal. You’ve worked hard, there needs to be a prize at the end of the tunnel to make it real. Well there you have it. I know you can achieve your Fitness Goals. So get started, what are you waiting for. If you run into trouble or want some help contact me, that’s why I’m here. Let me know how your doing. Remember you can achieve your Fitness Resolutions in 2011; and when you do you’ll feel better, look better, and work better. Life will be better. Achieve your Fitness goals you can do it, make yourself the best you can be in 2011. I enjoy snacking and here's one of my favorites; and it not only tastes great it's not bad for you. 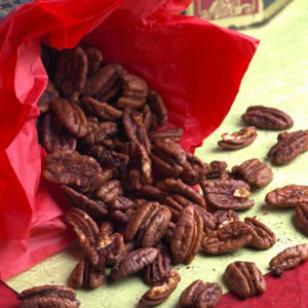 It's a medley of warm spices tempered with just a touch ofbrown sugar which is a great match for rich, nutritious pecans. They make a perfect snack with a drink before dinner or afterward with a cup of espresso or good coffee. 2. Combine chili powder, cumin, coriander, paprika, brown sugar and garlic powder in a small bowl. Toss pecans and Worcestershire sauce in a large bowl. Sprinkle the spice mixture over the pecans, tossing to coat. Spread the spiced nuts on the prepared baking sheet. 3. Bake the pecans, tossing every 8 to 10 minutes, until lightly browned and very fragrant, about 35 minutes. Transfer to a bowl; sprinkle with salt and toss well. Let cool. 102 calories; 22g fat (2 g sat, 12 g mono); 0 mg cholesterol; 6g carbohydrates; 3g protein; 4g fiber; 193 mg sodium; 178 mg potassium.